I’ve wanted to put something up on the walls of our master bathroom for ages now and I’ve been hunting for just the right thing. It’s been so empty looking. I have also wanted to find a solution for storing my jewelry. I have a box in the closet where I keep some pieces but I’m the type that forgets about what I have unless I can see it. I wanted a way to put some things out in view so I wouldn’t forget about the earrings I have or the necklaces I love. When I saw it in the thrift shop it sang to me. Yes, this old garden trellis was missing a pot. But I didn’t care. I didn’t want it for it’s pots anyway. I took one off and used the ring it left behind to hang necklaces on. The rings were also great for hanging sunglasses. Earrings fit easily on the metalwork and it was pretty simple. 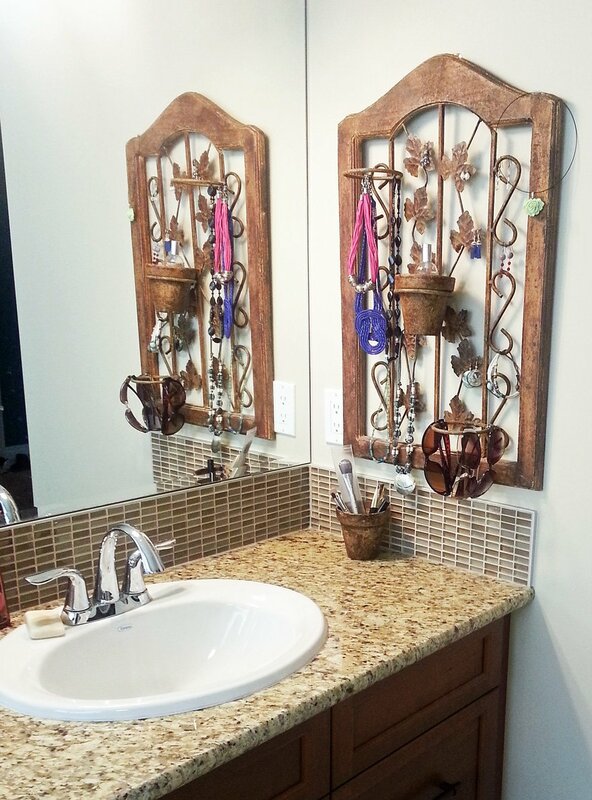 Hang it up and fill it with jewelry! There’s not much else to say. I liked the original color so I didn’t mess with it but it could have easily been spray painted. Those rings also come off so if I decide I don’t need them I can remove them. I left one pot on there and used it to house a bottle of perfume. Here’s another photo. The finish really was just right for our bathroom – the tones matched exactly. This almost never happens so I felt like I needed to take advantage of an ‘easy project.’ All I had to do was add some picture hanging wire to the back of the frame with a staple gun and hang it up. For $10 I couldn’t pass it up and I think I’ll get a lot of use from it. I love taking something that’s broken and useless and bringing it back to life. Shopping at thrift stores is not only a way to save myself some money but it’s also a way to avoid adding stresses to our already overworked landfills. This saved me from purchasing something new and that makes me happy happy! Have you found any treasures at a thrift store lately? I’d love to hear about them in comments! Thanks Erin! I’m pretty happy with it. Awesome repurpose! and the rack itself is so pretty!! Ahhhhh…. thrifting- my favorite past time! I love this idea. Looks very cool. That looks great, perfect in that spot – good score!! Great idea and you have the perfect place for it! Thrift store finds are my favourite! Love how you repurposed this one – I would never have thought of that! What a clever idea and the colour is perfect!